When the album cover is showing a Mexican wrestler wearing a mask, I'm of course very eager to listen to the music. 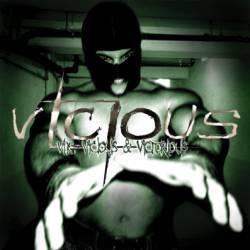 Unlike Nasty Savage and Fozzy, there are no wrestlers involved in Vicious, a death metal band from Norway. Vile, Vicious & Victorious is their first full-length CD, but they have already released four EPs in the past. Although there are a couple of thrash metal elements in their music, the main influence for Vicious is the popular Swedish death metal scene. The opener Beast is a classic death metal track with brutal vocals and quite harmonic guitar lines. If you had put this track on the latest Amon Amarth record, you wouldn't have noticed that this is a different band. The song writing is very convincing, with the songs containing lots of interesting breaks. High On Fire, Deadicate and Deathrash are just a few examples to underline the band's capacities. Although I can't complain about variation on this album, it doesn't differ too much from already more established death metal acts, especially from Sweden. Vile, Vicious & Victorious is far away from being a badly played album, but in general, I expect more originality from a band that has been around for five years. Death metal completists may need this debut, but I have other favourites in this genre.